Concerns have been expressed that gene patents might result in restricted access to research and health care. The exponential growth of patents claiming human DNA sequences might result in patent thickets, royalty stacking and, ultimately, a ´tragedy of the anti-commons´ in genetics. The essays in this book explore models designed to render patented genetic inventions accessible for further use in research, diagnosis or treatment. The models include patent pools, clearing house mechanisms, open source structures and liability regimes. They are analysed by scholars and practitioners in genetics, law, economics and philosophy. 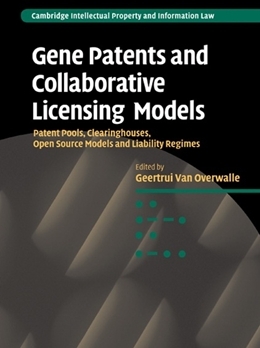 The volume looks beyond theoretical and scholarly analysis by conducting empirical investigation of existing examples of collaborative licensing models. Those models are examined from a theoretical perspective and tested in a set of operational cases. This combined approach is unique in its kind and prompts well founded and realistic solutions to problems in the current gene patent landscape.